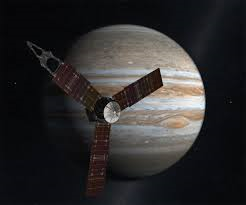 Today (October 9, 2013) the Juno spacecraft is going to be doing a flyby of Earth, as part of its ongoing journey towards the gas giant planet Jupiter. The probe launched in August 2011, and since then it has flown one long elliptical orbit around the Earth and the Sun. While it might sound a little odd to launch a probe to Jupiter by flying around Earth, it’s also completely necessary: the Juno probe is big. Weighing in at 8,000 lbs (3,267 kg) there was no rocket powerful enough to launch it on a direct trajectory for Jupiter. The purpose of today’s flyby is to allow Juno to ‘slingshot’ through the Earth’s gravity and gain the necessarily speed to be able to reach Jupiter – which is scheduled to occur in July 2016. Juno will in fact gain 26,280 km/h (16,330 mph) of speed through this maneuver. Juno’s closest approach to Earth will be at a distance of only 560 km (350 mi) – which is slightly higher than the International Space Station, which orbits at roughly 400 km (250 mi). Considering that Juno has been flying through space for more than two years already, travelling hundred’s of millions of kilometers, passing within 560 km of Earth to slingshot perfectly towards Jupiter is a fairly impressive feat. Though other probes have used this technique before, it is a credit to the precise mathematical understanding of our solar system’s gravity. Additionally, Juno is the first probe travelling to the outer solar system that is powered by solar panels (it has three truck-sized panels, roughly 2.7m x 10m). When Juno arrives at Jupiter, the $1.1 billion probe will study the planet’s atmosphere, gravitational field, and magnetic field in hopes of better understanding the makeup of the planet and shed light on its origins. Today’s slingshot maneuver is not impacted by the nonsense in Washington and the US government shutdown. Mission-critical operations at NASA continue to operate normally.